At 34 weeks, you may be feeling ready to deliver your little one; however, your baby still has some developing to do. As you wait out the final weeks of your pregnancy, it's a great time to get things ready for your baby's arrival. Your little one now weighs in at almost five pounds and about 18 inches long from head to foot. During the 34th week of your pregnancy, your baby is busy building his immune system, according to NCT.org. When born, he will have the necessary immunities to fight mild infections. However, the immune system won't reach its full strength until much later. Is a Chair Massage Okay During Pregnancy? You may also notice that your baby moves as you do. Your little one's back and trunk are heavier than his front. When you lie down on your side, gravity may roll your baby so that his trunk is now on your side. If you spend most of your time leaning back in a chair or on the sofa, your baby's back will rest against the back of your uterus. Since the optimal position for your little one is with the trunk against the front of the uterus, it's a good idea to do as much leaning forward as you can to help facilitate this position. Sometime between week 32 and week 36, according to Brown Alpert Medical School, most babies will settle into a head-down position for delivery. You may notice when this happens, but you also may not. It's also possible that your baby will continue to change positions up until just a few days before your due date. According to the American Pregnancy Association, you may be able to feel the top of your uterus about five and a half inches above your navel. Some of the volume inside your uterus is due to amniotic fluid. At this point in your pregnancy, the amount of amniotic fluid is near peak levels. However, this volume will decrease slowly to allow your little one to continue growing. You may notice that your baby's movements become smaller as he has less room to move. However, if you notice that your baby hasn't moved for several hours, you should call your doctor or midwife. As always, if you notice signs of labor or a change in vaginal discharge, you should contact your healthcare provider. If you haven't already done so, week 34 is a good time to prepare your home for your baby's birth. While most women won't give birth until after 37 weeks, there is always a possibility that your bundle of joy could arrive earlier than expected. If you're carrying multiplies, it's especially important to be prepared for your delivery. 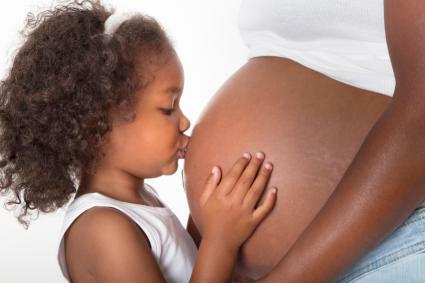 Most mothers of multiples will go into labor before pregnancy calendar week 37. In fact, 60 percent of twin deliveries occur before 37 weeks. Getting ready for your baby's arrival can be a great way to take your mind off your discomfort during these last few weeks of pregnancy. You may want to pack your hospital bag, wash your baby's clothing, and stock up on diapers. If you're still feeling up to cooking, you may want to stock your freezer with casseroles and other easy-to-prepare meals. It's also a good idea to keep your car filled with gas at all times. If you have other children at home, involving them in the preparations can help facilitate the bonding process. Have your young children make a banner for the nursery or a handmade card for their new brother or sister's baby book. If your children are slightly older, use a doll to teach them how to diaper and hold a baby. Since many children feel left out when a new sibling arrives, make it a point to spend some one-on-one quality time with your older children during these last few weeks of your pregnancy. If you need help downloading the pregnancy calendar, check out these helpful tips. If you're starting to grow tired of being pregnant, you can take comfort in knowing that there is now a light at the end of the tunnel. You only need to endure a few more weeks of stretch marks, itching, indigestion, constipation, round ligament pains, frequent urination, and other bothersome pregnancy symptoms before you get to meet your baby for the first time.